Cyanide, Arsenic, and Other Toxins in Fruit: Apple Seeds, Peach Pits, Cherry Pits, etc. : Facts, Mythes and Old Wive's Tales. Find Out ther Truth! Looking for Cyanide, Arsenic, and Other Toxins in Fruit: Apple Seeds, Peach Pits, Cherry Pits, etc. : Facts, Mythes and Old Wive's Tales. Find Out ther Truth! in 2019? Scroll down this page and follow the links. And if you bring home some fruit or vegetables and want to can, freeze, make jam, salsa or pickles, see this page for simple, reliable, illustrated canning, freezing or preserving directions. There are plenty of other related resources, click on the resources dropdown above. With the popularity of juicers and food grinders, some people seem to think that grinding up entire fruit (skin, seeds, pits, stems and all) is somehow healthier than tradition methods. This is not always the case. Some parts of some fruit are not only unpleasant to eat, they can even be dangerous. Here are the facts about toxic parts of fruit. Apple and crabapple seeds (and seeds of some other fruits, like cherries, peaches, apricots) contain amygdalin, an organic cyanide and sugar compound that degrades into hydrogen cyanide (HCN) when metabolized. Cyanide itself is a poison that kills by denying blood the ability to carry oxygen and thereby causes its victims to die. It's not an urban legend that apple seeds contain cyanide; even Snopes.com has an article about it. "The Dr. Oz Show" did an episode in which they talked about the amount of arsenic in children's apple juice. Apple seeds also have a tough protective coating seals the amygdalin inside, unless the seeds are crushed, chewed or otherwise ground up. Whole apple seeds have hard, durable shells that allow them to pass intact through the digestive systems of people and animals. Don't worry: It would take a bushel's worth of ground up apple's seeds (about 1 cup of seeds) to create enough cyanide to poison someone. Grinding apples and pressing them for apple juice or apple cider wouldn't release enough cyanide to be a problem. Neither does cooking apples and straining them to make a sauce. Richard E. Barrans Jr., Ph.D. Assistant Director PG Research Foundation in Darien, Illinois says "About the only way you can actually ruin into a problem with the toxicity of apple seeds is if you save the seeds from about a bushel of apples and eat them all at once." Still, I don't think I would intentionally group up the seeds and include them in foods. 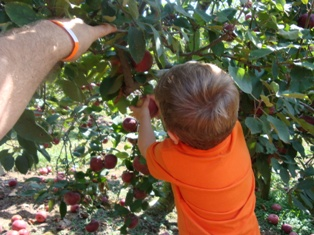 When we make homemade applesauce or juice, the seeds are exclude in the process and most are not even broken nor ground. Cyanide toxicity is experienced by humans at doses of around 0.5-3.5 milligrams per kilogram of body weight. Symptoms of cyanide poisoning include stomach cramps, headache, nausea and vomiting, and can culminate in cardiac arrest, respiratory failure, coma and death. A fatal dose for humans can be as low as 1.5 milligrams per kilogram of body weight. Cherry, peach, and apricot pits, on the other hand, also contain amygdalin, a form of cyanide. Peach and apricot have it in potentially harmful amounts. Of course, few people intentionally swallow or chew them. This NY Times article explains more. Why is cyanide present in these fruit seeds? Organic and inorganic forms of arsenic can be found in soil, both naturally occurring and due to the use of cyanide-containing pesticides prior to the 1970's. As a result, small amounts may taken up by the plans and become found in certain food and beverage products. See the FDA article here. So, is organic juice better? Logically, yes. But there are not yet credible and objective, independently conducted studies to prove this. And a certain amount of cyanide is normally present in the seeds anyway, as discussed in the first paragraph. You could argue that homemade applesauce and apple juice is safer, because you can ensure the seeds are excluded and not ground up. The U.S. Food and Drug Administration has conducted their own research and proposed a maximum limit for arsenic levels in apple juice. The FDA proposal limits the level of inorganic arsenic to 10 parts per billion. That is the same level as is allowable in drinking water under the Environmental Protection Agency rules. This is the first time the FDA has set limits for arsenic levels in commercial food or drinks. A visitor writes on September 04, 2017: "Hi, with regards to the toxicity of apple seeds - can you tell me if this reduces with cooking? I forage for wild apples then cook them whole, crush them and extract the juice to create pectin for jam making. I then use the pulp, crushed bits of seed included, to make an apple paste - this involves cooking with sugar to a temperature of at least 104%c. I\'ve eaten the results - very nice - but I\'m worried about passing samples to others in case there might be some risk from the seed content. Thanks. Cheryl"
No, arsenic is inorganic, so cooking would not destroy it. And crushing, if it results in the seeds being broken, would likely increase the amount of arsenic. I use an apple slicer/corer, the kind you just push down over the apple, that has a circle that avoids the core; that way the seeds are unlikely to be broken. Of course, the question is really, how much risk does this pose? It might still be trivial, or not. With out testing your product, it would remain unknown. AMA Handbook of Poisonous & Injurious Plants by Dr. K. F. Lampe & M. A. McCann, Chicago, IL 1985.